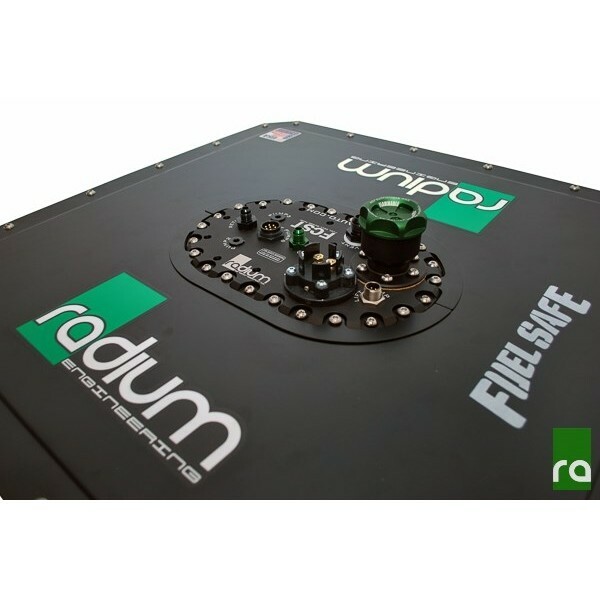 Radium Engineering's Fuel Cell Surge Tank (FCST) is a fill plate replacement for popular fuel cells. The FCST is designed for EFI vehicles experiencing fuel pump starvation issues while using a competition fuel cell. The FCST is NOT a glorified trap door box. It is the first of its kind to feature a true dual-chamber fuel tank utilizing a single lift pump and up to three surge tank pumps, all in a compact drop-in package. The Fuel Cell Surge Tank (FCST) is a fill plate replacement for popular fuel cells. 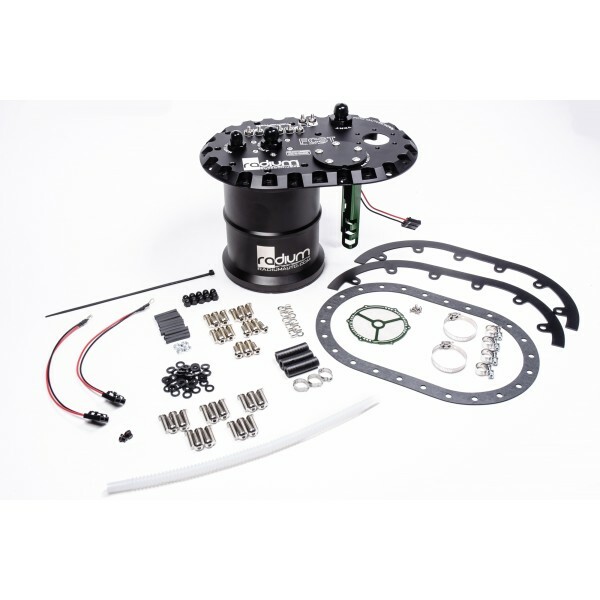 The FCST is designed for EFI vehicles experiencing fuel pump starvation issues while using a competition fuel cell. The FCST is NOT a glorified trap door box. 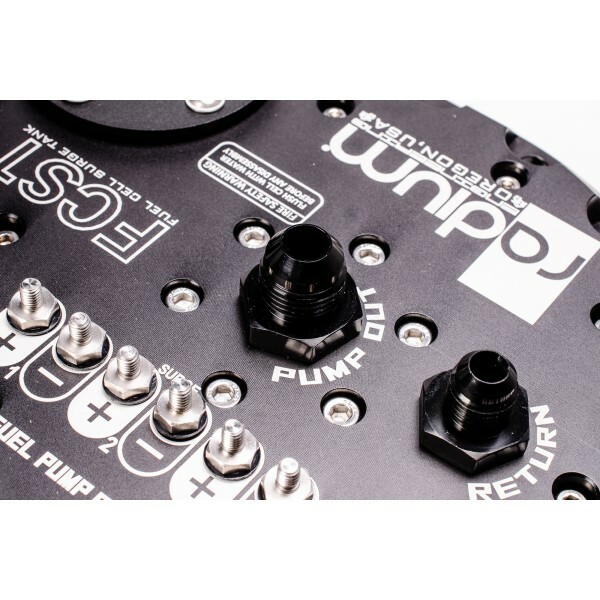 It is the first of its kind to feature a true dual-chamber fuel tank utilizing a single lift pump and up to three surge tank pumps, all in a compact drop-in package. 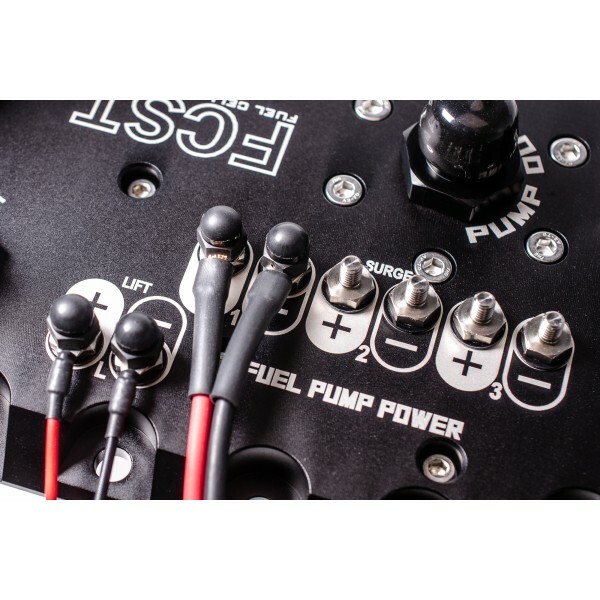 The FCST also provides a quick and easy way to drop-in an upgraded fuel pump system for extra flow for vehicles with large power demand upgrades such as forced induction. Alcohol fuels such as E85, methanol, etc can be safely used. The FCST uses the tried and true Radium Engineering fuel surge tank system preferred by professional motorsports teams worldwide. The optimized 2.2 liter canister supports 1, 2, or 3 internally mounted surge tank pumps capable of up to 1,350LPH @ 43psi. The fuel pumps inside the surge tank provide the primary fueling to the engine. The "lift pump" mounts next to the surge tank canister and keeps the chamber filled. The volume of fuel inside the surge tank acts as a buffer always keeping the surge tank pump(s) supplied with fuel. This volume is also maintained by the "return" from the fuel pressure regulator. Excess fuel in the integrated surge tank bleeds out into the fuel cell without the need of expensive hoses and fittings. All of this is done inside the fuel cell with the FCST.